With the above chapters from the ‘Book of Heaven’ as well as the numerous references in the following prayers for Pentecost, let us pray in the Holy Divine Will for this Great Outpouring of the Holy Spirit, the Second Pentecost, the Second Coming of Our Beloved Spouse Jesus in the Divine Will, One with Luisa. May Our Lord find His Complete Outpouring in us, forming the Dawn, the First Rest of God within the room of our souls, giving to God the Glory as if from All souls Living in the Holy Divine Will. V17 – May 17, 1925 – “…Furthermore, while We – the Three Divine Persons – remain always united in working, if Creation is related to the Father, and Redemption to the Son – the “Fiat Voluntas Tua” was attributed to the Holy Spirit. And it is exactly in the “Fiat Voluntas Tua” that the Divine Spirit shall display His Work. V9 – Nov. 1, 1920 – “My daughter, the supreme unity is when the soul reaches such tightness of union with my Will as to consume any shadow of her own will, in such a way that it is no longer possible to discern which one is my Will and which one is hers. Then my Will becomes the life of this soul, in such a way that whatever thing It may dispose over her as well as over others, she is content with everything. Anything seems to be suitable for her; death, life, cross, poverty, etc. – she looks at all of these as her own things, which serve to maintain her life. She reaches such an extent, that not even chastisements frighten her any more, but she is content with the Divine Will in everything, so much so, that it seems to her that if I want something, she wants it too; and if she wants it, the Lord does it. I do what she wants, and she does what I want. V23 – Oct. 16, 1927 – “My daughter, My Will possesses the Unity, and one who lives in It lives in this Unity. And do you know what Unity means? It means one—a one that can embrace everything and everyone, and can give everything, because it encloses everything. My Divine Will possesses the unity of love and of all loves united together; It possesses the unity of sanctity and encloses all sanctities; It possesses the unity of beauty and encloses within Itself everything beautiful that is possible and imaginable. In sum, It encloses the unity of light, of power, of goodness, of wisdom. V23 – Feb. 20, 1928 – “My daughter, you have not comprehended well what unity means. Unity means centralization and origin of all the acts of creatures, past, present and future. So, before sinning, when he possessed Our Unity, Adam enclosed within his thoughts the unity of all the thoughts of creatures, the unity of all words, works and steps. Therefore, I would find in him, in My Unity, the origin, the continuation and the end of all the acts of the human generations. V24 – Apr. 6, 1928 – “Now, this is symbol of the soul who wants to live in the Unity of Our Will. She rises into the sphere of the Sun of the Eternal Fiat, that contains so much light that no one can escape it, and possesses all the seeds of the lives of creatures. Its light goes about investing and molding everyone, and prays that each one may receive the life, the beauty, the sanctity wanted by their Creator. And the soul, from that sphere, becomes of all and gives herself to all; and she repeats Our Act, which is one, but that one act has the virtue of doing everything and of giving itself to all, as if each one had it at one’s disposal and it were one’s own. V35 – Aug. 15, 1937 – “Further, you must know that Living in Our Will is Unity, to the extent that, if the creature loves, God is always at the Head of her Love. So, His Love and her love are One Single Love. If the creature thinks, God is at the Head of her thoughts; if she speaks, God is the Source of her words; if she works, God is the Prime Actor Operating in her works; if she walks, God leads her steps. To Live in My Will is nothing other than the life of the creature in God, and the Life of God within her. V19 – Mar. 19, 1926 – : “My daughter, my Mama was conceived without original sin so that She might be able to impetrate the longed for Redeemer, because it was right and decorous that not even the seed of guilt would ever have existence in the one who was to be my Mother. She was to be the noblest, the holiest of all creatures – but of a divine nobility and of a holiness all similar to Her Creator, that He might find in Her so much grace and capacity as to be able to conceive the Holy of Holies – the Eternal Word. V28 – Nov. 30, 1930 – “After this, I continued to follow everything that, admirable and sublime, the Divine Fiat has done in Creation; and I said to myself: “I want to enter into the sun in order to find the Divine Will operating in its light, so as to give to It all the beauty, the purity, the holiness, the power, that a human will operating in its light can contain. V33 – Jul. 20, 1934 – “…See, therefore, everything and everyone have beginning and are born together with My Will, Innocent and Holy and Worthy of He who has created them. But who is the one who conserves this Innocence and Holiness? One who is always at her place in My Will. She alone is the Triumphant One in the space of the universe. She is the Standard-Bearer, and she gathers together the whole army of Creation in order to bring them to God, with speaking voice and with full Knowledge, the Glory, the Honor, and the Tribute of everything and everyone. V6 – Jul. 29, 1904 – I could also see wars, like that between Russia and Japan, the thousands of soldiers who were dying and will die, and that by justice, also natural, the victory will be of Japan; and I saw that other European nations are plotting machinations of war even against nations of Europe. But who can say all that I could see of God and in God? So, to end it, I stop here. V34 – Jun. 18, 1937 – “…You must know that Our Creation in man is not finished, because it was interrupted by the withdrawal that he made from Our Volition. Not Reigning in him, We could not entrust Ourselves to him, and therefore the continuation of Our Creative Work remained as suspended. So with anxiety We await that he returns into the arms of Our Fiat, so that he let It Reign, and then We will repeat the continuation of the Creation, and O! how many Beautiful Things We will do. “We will give Surprising Gifts. Our Wisdom will put forth all Its Divine Art, and O! how many Beautiful Images that resemble Us will Its Divine Light put forth, all Beautiful, but distinct from one another in Sanctity, in Power, in Beauty, in Love, in Gifts. Our Love will not be hindered anymore; finding Our Volition it will be able to do and give what it wants, therefore it will display so much in giving in order to recover the losses of Its repressed Love. And since We will be Free in giving, We will call them ‘Our Times’; We will make Ourselves known for who We are, how much We Love them, and how they should Love Us. We will give them Our Love at their disposition, so that We could Love each other with one single Love. In fact, one who will Live in Our Volition will be Our Triumph, Our Victory, Our Divine Army, the continuation of Our Creation and its Completion. Before this Second Pentecost begins, we see today that the mystery of iniquity is rampant in a world revolted from truth. The worldly man is the man of sin (2Th 2:3,4). The governments have revolted against the people (Apoc 6:2). The rulers of money have revolted against the poor (Apoc 6:6). The people have revolted against society (1T 4:1,2). The churches have revolted against God (2T 3:5). The wicked one, the man of sin, has arrived, doing the works of Satan in all power, signs, lying wonders, and in all seduction of iniquity, in every sector of society, seeking the destruction of truth. Jesus Christ promised that He would give us another Paraclete to abide with us forever (Jn 14:16-18). 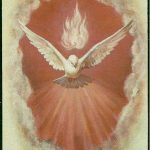 The Holy Ghost is the Spirit of Light, of Strength, and of Love, Who comes with His sevenfold gifts enlightening our minds, strengthening our wills, and inflaming our hearts with the love of Almighty God, Holy Trinity, teaching us all truth, showing us the things that are to come. It is through Holy Eucharist, we are brought into full unity with God, in spirit, soul, and body, abiding in the Holy Trinity, in the mystery of faith, in the gift of the Second Pentecost (Jn 17:21). V36 – Aug. 12, 1938 – “…So, Creation is not finished, but still continues in the souls who Live in Our Will, and if the Order, Beauty and Power of Our Works can be seen in the Creation, then the Love, Order and Beauty of Our Creative Virtue will be seen in the creature, repeating Our Divine Lives each time the creature gives Us her acts to le Us Work. The creature is Life. It operates differently than Creation. Therefore We feel an Irresistible Love to form Our Lives within her. O! how We fling Ourselves—how Happy We are—how Our Love finds Its Rest and Our Will Its Completion, which is forming Our Life in her! Jesus said: “I tell you the truth: it is expedient to you that I go. For if I go not, the Paraclete will not come to you: but if I go, I will send Him to you. And when He is come, He will convince the world of sin and of justice and of judgment…But when He, the Spirit of Truth, is come, He will teach you all truth, for He shall not speak of Himself: but what things so ever He shall hear, He shall speak, and the things that are to come, He shall show you. He shall glorify Me: because He shall receive of Mine and shall show it to you. All things whatsoever the Father has are Mine. Therefore I said that He shall receive of Me and show it to you” (Jn 16:1-15). V31 – Jan. 29, 1933 – I was thinking about the many Truths that my adorable Jesus had manifested to me about the Divine Will, and O! how many thoughts crowded in my mind of surprises, of joys, of emotions, about these Truths. It seemed to me that they descended from Heaven all ordered so as to fill the earth, and their Work was to form the way in themselves, in order to let us re-enter into these Truths, then they would wall themselves around creatures, in order to not let them leave. And my Celestial Jesus, visiting my little soul, told me: “My little daughter of My Volition, You Must Know that every Truth that I have manifested about My Divine Will, was nothing other than one more approach towards creatures. Our Supreme Being, as It spoke, so It took one more step toward them, It placed one more Divine Particle at their disposition, and cast New Bonds of Union and of Love. Our Word is always Our Birth, it is Our Word that We placed on the way from Heaven in order to seek Our yearned for creature, and Our Sacrosanct Trinity, drawn by the Power of the Word—because He was inseparable from Us—made Us take Our next steps, and, step by step, We arrive at where Our Word reaches. “Therefore, My daughter, be attentive in to listening to My Truths. First you must think about where they come from, Who hands them to you, the Good that they want to make you, the steps of both sides to draw near each other. Do not want to put them in doubt because you do not see in the world the Effects, the Good, the Life that My Truths possess. Time will do and will say everything, for now do your part, for the rest, let your Jesus think about it. The Holy Ghost is co-equal and co-eternal in the Holy Trinity. He continues to protect us with the outpouring of grace, filling our hearts and enkindling in us the fire of His divine love, enlightening, guiding, strengthening, and consoling us, and bringing all who will believe and trust in Him, into the fullness of Eucharistic oneness and unity in our Lord Christ Jesus, as He destroys sinful worldly man with the spirit of His mouth in this the Second Pentecost. In the Second Pentecost, through the gift of the Holy Ghost, the Holy Trinity abides in the new man, Eucharistic man. This gift is the True and Everlasting Godhead, living in the New Creation, the new man – Eucharistic man, who through Holy Eucharist is elevated into the Godhead as is told: “For in Him dwells all the fullness of the Godhead corporeally, and you are filled in Him” (Col 2:6-10). It is in the power of the Holy Ghost in the Second Pentecost that the man of sin is revealed, and is destroyed with the brightness of the coming of Priest of God, in Eucharistic man. V11 – Mar. 15, 1912 – “…It seems that the souls who live in my Will do nothing, while they actually do everything, because being in my Will these souls act Divinely, in a hidden and surprising way. They are light which illuminates, wind which purifies, fire which burns, miracles which cause miracles. Those who do miracles are channels; but in these souls resides the power. Therefore, they are the foot of the missionary, the tongue of the preachers, the strength of the weak, the patience of the sick, the regime (of the superiors), the obedience of the subjects, the tolerance of the slandered, the firmness in the dangers, the heroism in the heroes, the courage in the martyrs, the sanctity in the saints, and so on with all the rest. Being in my Will, they concur with all the good that can be both in Heaven and on earth. V12 – Mar. 27, 1918 – “…since I AM present in each Sacrifice, the soul who lives with Me and in my Will remains sacrificed together with Me – not in one Mass, but in all the Masses. And since she lives in my Will, she remains consecrated with Me in all the Hosts. We who wish to enter into the Second Pentecost, must leave all worldliness behind us. Having done this, we will have the high praises of God in our mouth, and two-edged swords in our hands, to execute vengeance upon the nations, chastisements among the people, to bind the kings with fetters, and the nobles with manacles of iron, to execute upon them the judgment that is written, this glory is to all the saints of Christ Jesus (Ps149:6-9). of sin and of justice and of judgment. Of sin: because they believed not in Jesus. Of justice: because Jesus has ascended to God the Father. and casts him into hell for all eternity (Apoc 20:9,10). It is in this great gift of Holy Eucharist, that we are filled unto all the fullness of the Holy Trinity, Father, Son, and Holy Ghost, and are given the power to be made the sons of God (Jn 1:12). We, the sons of God, come to God the Father in Eucharistic unity in Jesus, and thank Him that through the gift of the power of the Holy Ghost in this the Second Pentecost, we His new creation, Eucharistic man, Christ Jesus, destroy the forces of evil, as we rejoice in Jesus Eucharist, Blessed Sacrament, Son of God, our Lord, Who lives and reigns with God the Father and the Holy Ghost, Eternal Triune God, for the eternity which never ends. V11 – Jun. 12, 1913 – “…Now, since the only thing left to you is the opportunity of uniting and identifying yourself with Me, you take everything from Me. Unable to do any good by yourself, with Me you become good at everything, because desiring and wanting good produce strength in the soul which makes her grow, and which settles her in the Divine Life. Then, by uniting and identifying herself with Me, she unites with my mind, producing many lives of holy thoughts in the minds of the creatures; as she unites with my eyes, she produces many lives of holy glances in the creatures. In the same way, if she unites with my mouth, she shall give life to the words; if she unites to my Heart, my desires, my hands, my steps, she shall give a life for every heartbeat – life to desires, to actions, to steps… But holy lives, since I contain within me Creative Power, and therefore the soul, together with Me, creates and does whatever I do. Now, this union with Me – part to part, mind to mind, heart to heart, etc. – produces in you, in the highest degree, the Life of My Will and of my Love. The Father is formed in this Will, and the Holy Spirit in this Love; while the Son is formed by the operation, the words, the works, the thoughts, and by all the rest that can come from this Will and from this Love – here is the Trinity in the souls. In this way, if We need to operate, it is indifferent whether We operate within the Trinity in Heaven, or within the Trinity of the souls on earth. This is why I keep taking everything else away from you, although they may be good and holy things: to give you the best and the holiest – Myself; and to make of you another Myself, as much as this is possible for the creature. V34 – Jul. 25, 1937 – I felt myself transported into the Celestial Fatherland, in the middle of three circles of Light. At the head of them there was the Queen of Heaven at one point, and Our Lord at another, with an Enchanting Beauty, and Indescribable Love. In the midst of Them there was a multitude of souls, completely Transformed in the Light in which they Lived and grew, but guarded, directed, and nourished by Jesus and by the Celestial Mother. How many Beautiful surprises were seen, these souls possessed the Likeness and the Life of their Creator. V12 – Jan. 29, 1919 – “My beloved daughter, I want to let you know the order of my Providence. Every two thousand years I have renewed the world. In the first two thousand years I renewed it with the Deluge; in the second two thousand I renewed it with my coming upon earth when I manifested my Humanity, from which, as if from many fissures, my Divinity shone forth. The good ones and the very Saints of the following two thousand years have lived from the fruits of my Humanity and, in drops, they have enjoyed my Divinity. Now we are around the third two thousand years, and there will be a third renewal. This is the reason for the general confusion: it is nothing other than the preparation of the third renewal. If in the second renewal I manifested what my Humanity did and suffered, and very little of what my Divinity was operating, now, in this third renewal, after the earth will be purged and a great part of the current generation destroyed, I will be even more generous with creatures, and I will accomplish the renewal by manifesting what my Divinity did within my Humanity; how my Divine Will acted with my human will; how everything remained linked within Me; how I did and redid everything, and how even each thought of each creature was redone by Me, and sealed with my Divine Volition. The Great Apostasy spoken of in Scripture undoubtedly refers to our times. Christianity is in a state of such steep decline in the Western world that Pope John Paul II called for a “New Evangelization” to bring back the countless lost sheep led astray by the temptations of deism, agnosticism and atheism, and their bedfellows moral relativism, egoism and hedonism. V23 – Jan. 18, 1928 – “Now, what I manifest on My Divine Will, and that you write, can be called ‘The Gospel of the Kingdom of the Divine Will.’ In nothing does It oppose either Sacred Scriptures or the Gospel that I announced while being on earth; on the contrary, It can be called the support of one and of the other. And this is why I allow and I call Priests to come—to read the Gospel, all of Heaven, of the Kingdom of My Divine Fiat, so as to say, as I said to the Apostles: ‘Preach It throughout the whole world.’ In fact, in My works I make use of the Priesthood; and just as I had the Priesthood before My coming in order to prepare the people, and the Priesthood of My Church in order to confirm My coming and everything I did and said, so shall I have the Priesthood of the Kingdom of My Will. V20 – Oct. 22, 1926 – “My daughter, what do you think a greater miracle was when I came upon earth: My Word, the Gospel I announced, or the fact that I gave life to the dead, sight to the blind, hearing to the deaf, etc.? Ah! My daughter, My Word, My Gospel, was a greater miracle; more so, since the very miracles came out of My Word. The foundation, the substance of all miracles came out of My creative Word. The Sacraments, Creation itself, a permanent miracle, had life from My Word; and My very Church has My Word, My Gospel, as regime and foundation. “So, My Word, My Gospel, was a miracle greater than the miracles themselves, that, if they had life, it was because of My miraculous Word. Therefore, be sure that the Word of your Jesus is the greatest miracle. My Word is like mighty wind that runs, pounds on the hearing, enters into the hearts, warms, purifies, illuminates, makes my Round and my Round from nation to nation; it covers the whole world, it wanders throughout all centuries. Who could ever give death and bury one Word of Mine? No one. And if sometimes it seems that My Word is silent and is as though hidden, it never loses its life. When least expected, it comes out and goes Round everywhere. Centuries shall pass in which everything—men and things—shall be overwhelmed and disappear, but My Word shall never pass away, because it contains life—the miraculous power of He who issued it. that They Receive the Requital from the Holy Church and All Their children. and we beg You, Come Holy Spirit! of the Sacred Heart of Jesus be Established. at any Cost, we give our lives to Live in the Fiat! (V36-7.18.38). and the Fulfillment of Your Divine Will. so that the Spirit of the Lord shall be upon us, because the Lord has anointed us. and Life-Giving Spirit through the Divinity of Christ. that nothing else shall be able to enter the so very High Fences of Your Kingdom. Breathing Continuously into us, shall keep us always ignited and consumed for Love of Him. and Bind us with the Relations of His Sanctity. and make us Your Living Hosts. all the evils of the human nature shall have Life no more. the Beauty, the Splendor of the Whole Mystical Body by our continuous Living in Your Will. and completed in Your Most Holy Divine Will.